In this grim business of war, The Red Falcon Flies Alone. He carries no flag and owes allegiance to none. But the Falcon is still ready to give the service of his courage, and his guns, to the men who made him an outcast. Join Barry Rand and the great warrior Sika as they fly their patched together plane from their hidden base in the Vosges Mountains to battle the Germans and help win the Great War. 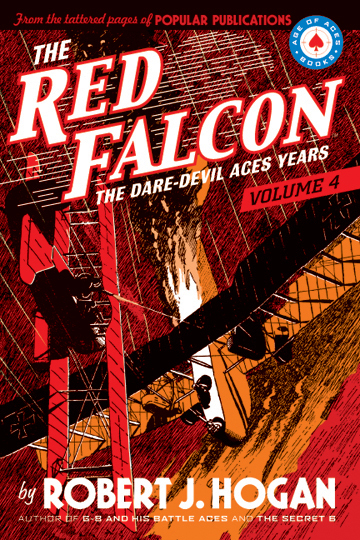 In this fourth exciting collection of Robert J. Hogan’s adventures of The Red Falcon, Age of Aces brings you the final stories from Barry Rand’s incredible run in the pages of Dare-Devil Aces magazine, including a second cross-over appearance by G-8 and His Battle Aces. Also in this volume is Scott Cranford’s new original story that chronicles The Red Falcon’s beginnings.